NOTE: If you are troubleshooting multiple DTCs, be sure to follow the instructions in B-CAN System Diagnosis Test Mode A (see page 22-134). 1. Clear the DTCs with the HDS. 2. Turn the ignition switch to LOCK (0) and then back to ON (II). 3. Wait for at least 6 seconds. 4. Check for DTCs with the HDS. -Faulty driver's MICU; replace the driver's under-dash fuse/relay box, USA models (see page 22-86), Canada models (see p a g e 22-87). 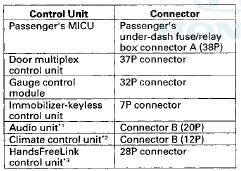 -Faulty passenger's MICU; replace the passenger's under-dash fuse/relay box (see page 22-89). NOTE; вЂў Before troubleshooting check the No. 5 (7.5 A) fuse in the driver's under-dash fuse/relay box. вЂў If you are troubleshooting multiple DTCs, be sure to follow the instructions in B-CAN System Diagnosis Test Mode A (see page 22-134). Check for loose or poor connections at the driver's under-dash fuse/relay box connector C (5P). If the connections are good, check the battery condition (see page 22-90) and the charging system. 5. Measure the voltage between gauge control module 32P connector terminal No. 32 and body ground. Faulty driver's MICU; substitute a known-good driver's under-dash fuse/relay box and recheck. -Repair an open or high resistance in the wire between the driver's under-dash fuse/relay box and gauge control module. NOTE: вЂў Before troubleshooting check the No. 5 (7.5 A) fuse in the driver's under-dash fuse/relay box. Check for loose or poor connections. If the connections are good, check the battery condition (see page 22-90) and the charging system. 5. Check the DTCs with the HDS. -Go to DTC U1282 troubleshooting (see page 22-291 ). 6. Turn the ignition switch to LOCK (0). 7. Disconnect passenger's under-dash fuse/relay box connector A (38P). 9. Measure the voltage between passenger's under-dash fuse/relay box connector A (38P) terminal No. 35 and body ground. -Faulty passenger's MICU; substitute a known-good passenger's under-dash fuse/relay box and recheck. -Repair an open or high resistance in the wire between the passenger's under-dash fuse/relay box and driver's under-dash fuse/relay box. 1 . Clear the DTCs with the HDS. Check for loose or poor connections at the gauge control module (32P) and the related u n i t s.
Check for loose or poor connections at the gauge control module (32P) and the related units. -Go to the door multiplex control unit input test, and do all power, ground, and communication input test (see page 22-151 )s. If the tests prove OK, replace the power window master switch, 4-door (see page 22-305), 2-door (see page 22-306). Check for loose or poor connections at the door multiplex control unit 37P connector and the related units. Check for loose or poor connections, or worn/shorted wires. If the connections are good, check the battery condition (see page 22-90) and the charging system. 6. Disconnect the appropriate connector at each control unit in the table one at a time. Clear the DTC, then recheck for DTCs after each unit is disconnected. -Leave the connectors disconnected, and go to step 7. -Go to the input test for the control unit that was disconnected when DTC U1280 did not reset and do all power and ground input tests. If the tests prove OK, replace that unit. вЂў Passenger's MICU input test (see page 22-154). вЂў Gauge control module input test (see page 22-347). вЂў Door multiplex control unit input test (see page 22- 292). вЂў Climate control unit input test (see page 21-172). вЂў Immobilizer-keyless control unit input test (see page 22-437). вЂў HandsFreeLink control unit input test (see page 23- 266). 8. Disconnect each control unit connector in the table. 9. Disconnect driver's under-dash fuse/relay box connector P (20P). 10. Check for continuity between driver's under-dash fuse/relay box connector P (20P) terminals No. 5 and No. 6. 11. Check for continuity between body ground and driver's under-dash fuse/relay box connector P (20P) terminals No. 5 and No. 6 individually. Repair a short to ground in the wire. 12. Turn the ignition switch to ON (II). 13. Measure the voltage between body ground and driver's under-dash fuse/relay box connector P (20P) terminals No. 5 and No. 6 individually. -Repair a short to power in the wire. Faulty driver's MICU, replace the driver's under-dash fuse/relay box, USA models (see page 22-86), Canada models (see page 22-87). -Go to the driver's MICU input test, and do all power, ground, and communication input tests (see page 22-151). If the tests prove OK, replace the driver's under-dash fuse/relay box, USA models (see page 22-86), Canada models (see page 22-87). Check for loose or poor connections at driver's under-dash fuse/relay box connector P (20P) and the related units. -Go to the passenger's MICU input test, and do all power, ground, and communication input tests (see page 22-154). If the tests prove OK, replace the driver's under-dash fuse/relay box, USA models (see page 22-86), Canada models (see page 22-87).